Minnesota Valley Health Center is again offering classes for interested individuals that want to become registered nursing assistants. Karen Holicky, MVHC Nursing Home's director of nursing, received her certification from Minneapolis Community & Technical College in May to teach these classes. The classes are 80 hours of guided instruction and hands-on work with the residents to ensure participants are confident and fully prepared to work with the residents. After students complete the class and pass the state exam, they are eligible to work as registered nursing assistants. Whitney O’Day and Lexi Buchholtz finished the class on July 28. Buchholtz has volunteered at MVHC since February and she said she has grown very close to some of the residents. She is thinking about going to nursing school when she graduates from high school, so the Registered Nursing Assistant class at MVHC is a great fit. O’Day recently began to pursue a career in health care and plans to attend nursing school in the near future. 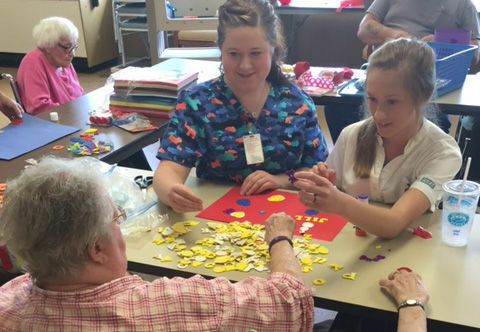 She has a family member who suffers from dementia, so she enjoys connecting with the nursing home residents who struggle with memory issues. The majority of the class consists of the students learning about activities of daily living so they can assist the residents. Students learn about these 58 activities and are then tested on them during a lab and clinical portion of the class. The activities range from helping the residents make their beds to assisting with personal care and hygiene to selecting meals and assisting the residents during meal time. Anyone who is interested in the class can fill out an application at mvhc.org/career-center.